"Flu symptoms" is a general description for a set of symptoms usually including fever, chills, malaise, dry cough, loss of appetite and body aches. These symptoms are present in many illnesses as these are the symptoms that occur as the body's natural response to fighting an infection. 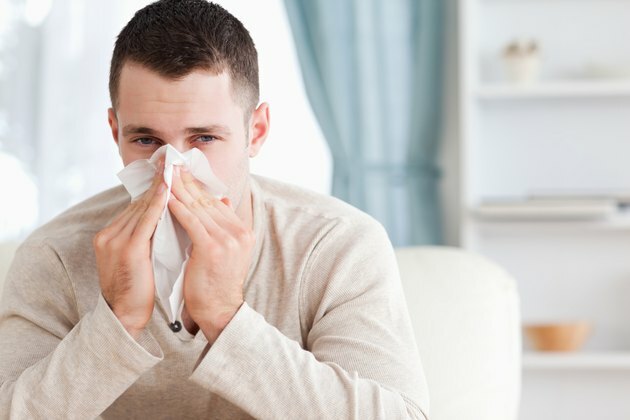 Because the flu and its symptoms are so well known, this group of symptoms is often lumped into one symptom when describing other diseases or conditions. Some of the most well known diseases that exhibit flu symptoms include meningitis, tuberculosis, food poisoning, hepatitis, Hodgkin's disease and Lyme disease. Meningitis is the inflammation of the membranes surrounding the brain and spinal cord. This disease is caused by a viral, bacterial or fungal infection that travels through the blood and into the brain. Flu symptoms are typically the first symptoms to appear but this disease, especially bacterial meningitis, can become serious resulting in brain damage, paralysis or even death. Tuberculosis, still one of the world's deadliest diseases according to the Centers for Disease Control and Prevention, is an infection caused by the Mycobacterium tuberculosis bacteria. The infection usually involves the lungs, but can also affect other parts of the body such as the bones, skin, kidneys, spine or brain. A tuberculosis infection may lay dormant in a person for many years, causing no symptoms, but an active infection begins with flu symptoms such as fatigue, fever, chills and loss of appetite. Food poisoning results from eating foods that are contaminated with bacteria and their toxins, viruses or parasites. Food poisoning often has symptoms similar to the intestinal flu including fever, chills, diarrhea and vomiting that may last from a few hours to several days. There are three types of hepatitis: hepatitis A, which is the most common form, hepatitis B and hepatitis C. Hepatitis A is considered a sexually transmitted disease but is actually transmitted from one person to another through contaminated feces. Symptoms of hepatitis A, similar to mild flu symptoms, usually appear 2 to 6 weeks after exposure to the virus and may last for up to 2 months, according to information provided by the Avert organization. Hodgkin Disease is a type of lymphoma, which is a cancer of the lymph nodes. Hodgkin Disease begins in the lymph nodes, usually in the upper portion of the body such as the chest, neck or under the arms, and causes the lymph nodes to swell. Because lymph nodes also swell in response to an infection in the body triggering flu-like symptoms, these symptoms are the first sign of Hodgkin Disease. Lyme Disease, the most common arthropod-borne illness according to the American Lyme Disease Foundation, is caused by an infection by the bacteria Borrelia burgdorferi that is passed on to humans by deer ticks. Lyme Disease is an inflammatory disease, which is why the initial symptoms are similar to flu symptoms that can affect the joints, nervous system and other organs. American Lyme Disease Foundation: What is Lyme Disease?